The Office of the University Registrar does not in general permit the respective Faculties to record and submit either informal interim/temporary grades or grades that serve as placeholders. All grades must be official, final grades that conform to the grading schema in place at the various Schools. Exceptions to this policy should be secured in advance from the Office of the University Registrar. Approval will be granted only on a case-by-case basis taking into account unique circumstances that are germane to a particular faculty member or student. 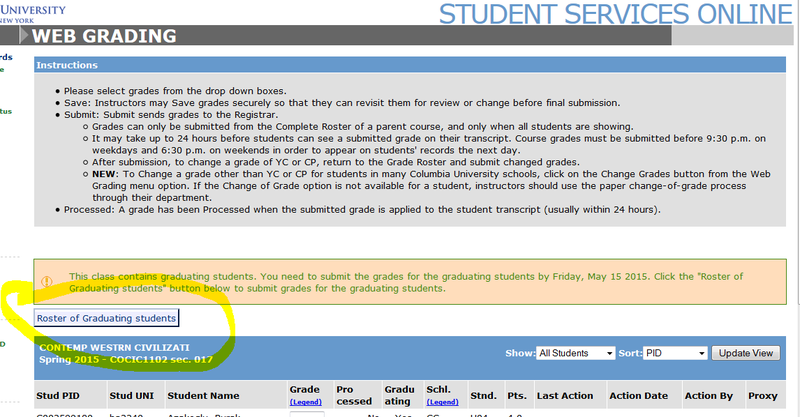 Click the Submit button on the web grade roster. You will then be required to check your work and perform a final submission. After the final submission, you will receive a message stating that grades have been successfully submitted. To determine whether or not your grades have been submitted, check the grade roster which will state the date, time and UNI of the individual who submitted the grades. Please note: Columbia and Barnard students who take the same classes will appear and be graded on a single grade roster. For assistance using Web Grading, please contact your departmental administrator or send an email. Enter the Course ID and Section ID and select the desired term. Select View Class to search. Archived grade rosters are available back to 1982. They can be downloaded into Excel to save or print. In the fall and summer terms, only a complete grade roster will be available. If grades are partially input they can be saved but not submitted until a value is entered for each student on the roster. Graduating - This roster lists only graduating students in a given class. Grades can be entered and submitted for students who appear on the Graduating roster. This will expedite clearance for graduation in the tight turnaround time between the end of term and commencement. Non-Graduating - This roster lists only students who are not graduating. Grades can be saved on this roster but not submitted. Complete - This roster lists all students enrolled in the class, both graduating and non-graduating. Grades submitted or saved on the graduating roster will appear here. Grades saved on the non-graduating roster will also appear here. Grades must be entered for every student on this roster before it can be submitted. This feature is currently available to most students at Columbia University. Instructors are responsible for initiating grade changes and must transact all grade changes directly in Student Services Online (SSOL). Students are prohibited from participating in the grade change process. To change a grade of YC or CP, return to the Grade Roster and submit changed grades. To change a grade other than YC or CP for students in many Columbia University schools, click on the Change Grades button from the Web Grading menu option. If the Change of Grade option is not available for a student, instructors should use the paper change-of-grade process through their department. A one-page overview of the benefits and functions of the new online Grade Change functionality. Note: All undergraduate grade changes must be approved by the school’s academic advising center.